Kids love to receive anything personalized, especially if they have a unique name or one that is not spelled in a traditional manner. 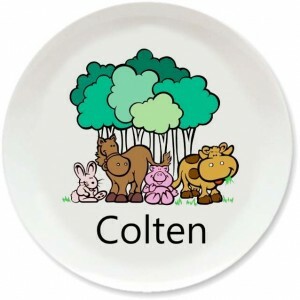 My kids were thrilled to each have a plate with their name, so much that we began ordering plates as gifts for friend birthdays. It’s that time again, when as parents, we reluctantly convene in the candy aisle, trying to rationalize the idea of buying candy for the Easter Basket and how much is enough? However, Easter Baskets don’t have to the routine and typical. Check out these five great ideas to make an Easter Basket your kids will love. Kids love to receive anything personalized, especially if they have a unique name or one that is not spelled in a traditional manner. My kids were thrilled to each have a plate with their name, so much that we began ordering plates as gifts for friend birthdays. The look on my daughter’s friend Ashleigh’s face when she opened her personalized gift was priceless. I’ve also created baskets with just the first letter of their name, using small items, such as a an initial notepad, travel mug, tote bag and beach towel. Many times, I purchased experiences for us to share and made coupons attached to a related object to put in the basket. A coupon for the movies was attached to a DVD; a coupon for a trip to the Science Center was wrapped with an inexpensive jar of green slime. I also found a small butterfly net and wrapped that with a day at the Botanical Garden. You can get pretty creative. This year, I had an idea to make a one-color basket. My daughter’s favorite color is blue, so I’m filling the basket with blue socks, a blue travel mug, a blue jump rope, a small pack of blue gum, blue ear buds and blue hair accessories. If you shop smart, you can pick up everything at the $5 and below stores, which will be a heck of a lot cheaper than buying candy. Teach kids the importance of unplugging from devices and picking up a good book. I go to our local book reseller and able to purchase books for.$50 or $1.00. Most kids read books once or outgrow the level. And, this is a great time to getting back to reading to your child. Most kids like the thrill of the chase. Fortunately, plastic eggs do not hold a lot of candy and it’s easy to fill a basket or hide a bunch of eggs and not put Timmy into sugar and chocolate overload. Eggs can be filled with chocolate kisses, a piece of sugar free gum, a chocolate coin, or small trinket toys. As you can see, baskets don’t have to be filled with sweets, treats and other sugar coated surprises. Keep the kids happy and healthy this Easter and try something new. Do you have an idea for a unique Easter Basket? Send us a note, we would love to hear from you and possibly share your story. Contact us through the link below.